Vathakuzhambhu is a usual one which i normally make with shallots, drumsticks or any othe rveggie. But this is the first time i am making with beetroot as one of my friend told that beetroot vathakuzhambhu is a popular one at her place. 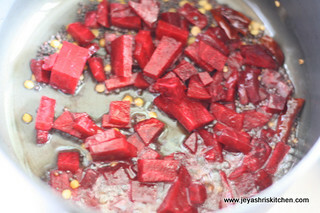 After i started making vathakuzhambhu with beetroot it has become a popular one at my house too. Go ahead and try this one and will like it for sure. Soak the goose berry sized tamarind in hot water and extract 4 cups of tamarind water. 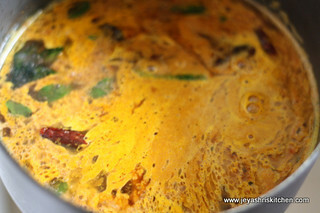 In a pan add oil and temper with mustard seeds , fenugreek seeds, toor dal ,red chillis and curry leaves. When the dal turn golden brown add the beet root and saute for few minutes. Now add tamarind water,sambar powder,turmeric powder,salt and asafoetida. allow this to boil till it reaches a thick gravy consistency. The beetroot will also get cooked by this time. 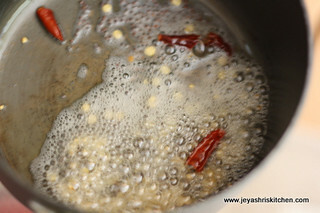 Add few curry leaves and smear a tsp of sesame oil on the top. Normally we add little jaggery to this kuzhambhu, but since beetroot has sweetness no need to add it. We had with Beans paruppu usili. You can make this vathakuzhambhu with any veggies of your choice. Some people add sambar powder in the oil and saute for a minute and add the tamarind water. So new to me, sounds great. Will try some time. so yummy n new verison cool. Never heard about this one.Very interesting and will try it. Beetroot vathkuzhambu is new to me. Look nice. My Small MIL used to do this Jeyashri.. when she told me I tried and we loved it.... The sweetness from beets and tanginess from tamarind works...I am way too tempted now. ah i remember this :) looks gorgeous! such a unique kulambhu.. looks colorful..
Vathakuzhambu using beetroot sure sounds interesting...Looks very tempting Jeyashri. Never have tried this.. 2mrw I plan to do vathakulambu and didn't have small onions..was wondering.. Perfect one to try.. will let you know. Wat an interesting and super creative vatha kuzhambu, loving this unusual twist to vatha kuzhambu. nice and healthy substitute...nice clicks..
first time here.yummy kuzhambu.happy to follow you.wil both be frndz? Vathakulambu is my fav. but addition of beetroot is new. Love to eat it anytime. First time in ur space :) Very New Recipe and nice thought !!! Tried it today. Came out very well. Added rice flour n water for thickness.